Grab a coffee, relax and enjoy a Headwater blog on the Lights! 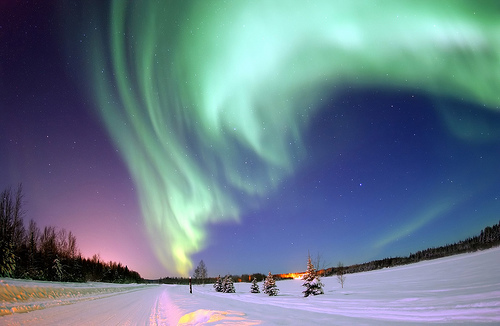 Anyone travelling to the far north this year – and in 2013 and the beginning of 2014, will be travelling when the sun is at a time of “solar maximum” – a peak in the cycle regulating output of solar storms. That means that displays of the Northern Lights, when they happen, will be more frequent, vivid and even more captivating than you can possibly imagine. Atmospheric conditions just now are particularly good for seeing the Northern Lights – a giant bonus on top of enjoying an exhilarating cross country ski holiday somewhere suitably northern! Our Venabu, Geilo and Lapland destinations are as cosy as they are beautiful, with acres of snow, miles of trails along which to glide, and as soon as the sun goes down – which is relatively early at this time of year – the Northern Lights may just come up. Although they are never guaranteed, this next few months will be a great time to get lucky, as they are becoming more and more visible further and further south. Seeing them is a genuine fairytale, so why not swop our mediocre chilly winter with wet sleet and black ice and salt all over the windscreen for a proper Scandinavian adventure and who knows? You may just be one of the lucky many who have ticked off this ‘Must Have’ travel experience. Meanwhile, this article in the Daily Telegraph describes an encounter!